Etko Centurion 1991 Vintage on the left and KEO St. John on the right. Cyprus is known on the international wine scene for Commandaria, the fortified sweet wine that is associated with the 13th Century history of the Island and the Knights of St. John. A little adventure seemed in order to become acquainted with this historic wine. Early one evening as the setting sun was painting a wintery crimson sky, we headed off into the hills above Paphos to the bar at the Minthis Hills Golf Club to conduct our own Commandaria tasting. An earlier reconnoitre had identified that Minthis Hills offers two Commandarias on their wine list: KEO St. John and Etko Centurion Vintage 1991 and these two seemed suitable candidates to help us increase our knowledge of this fortified wine. Notebook and pen in hand, we tasted the two wines individually and then made a comparison, looking at the key tasting areas of appearance, nose and palate. Both wines are clear in colour with different shades of chestnut brown; the vintage wine being darker and having a tinge of red in the brown. On the nose, the St John was clean with pronounced intensity and aromas of burnt raisins, nuts with a touch of caramel and hint of tartness. The Centurion was also clean on the nose with more pronounced aromas of nuts, figs, warmth and oak. 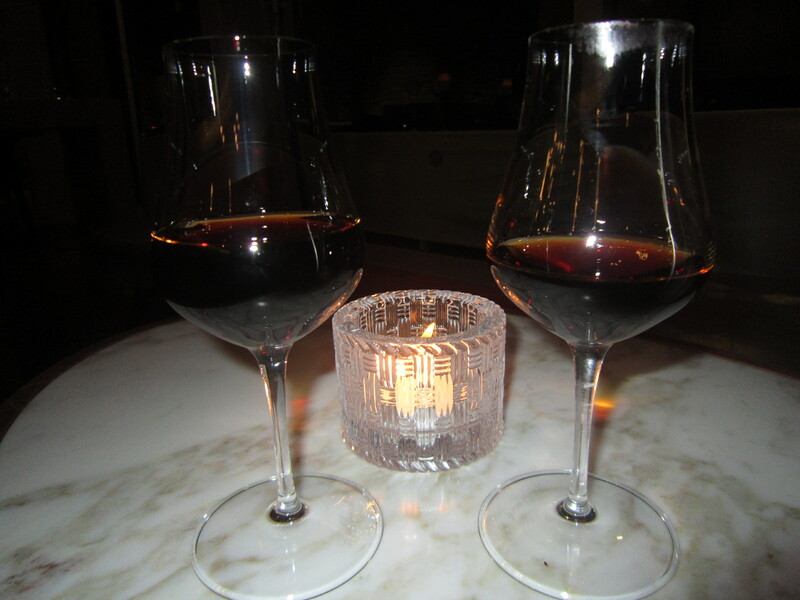 On the palate, they were both sweet with medium acidity and medium intensity. While clearly a fortified wine with alcohol levels at 15% each, neither was syrupy nor overly sweet or overpowering. The flavours of sultanas and figs came through and the Centurion, with the advantage of 22 years of ageing, also brought forth buttery, caramel oak flavours with a pronounced spiceness, with pepper and a touch of coffee. Both wines are very pleasant and given their high alcohol levels, we assessed them as more accessible than, say, an equivalent 15% Syrah. The Centurion Vintage 1991 delivered extra smoothness and flavour and came with a commensurate higher price. Both wines are made with indigenous grape varieties. The KEO St. John is made with Xynisteri, a white grape, and the Etko Centurion is made with Mavro, a black grape. Sitting in the comfort and warmth of the candlelit bar and relaxing as we tasted these wines, the conversation turned to history. The Commandaria wine traces its roots back to the Knights of St John, one of the monastic Hospitalier Orders which undertook both religious duties and the protection and care of travellers. When the Hospitaliers arrived in Cyprus after leaving Jerusalem in late 13th Century, a king of Cyprus conferred on them the right to acquire land and they developed their Commanderies. Over time, the wine they developed on their land around Limassol was called Commandaria. 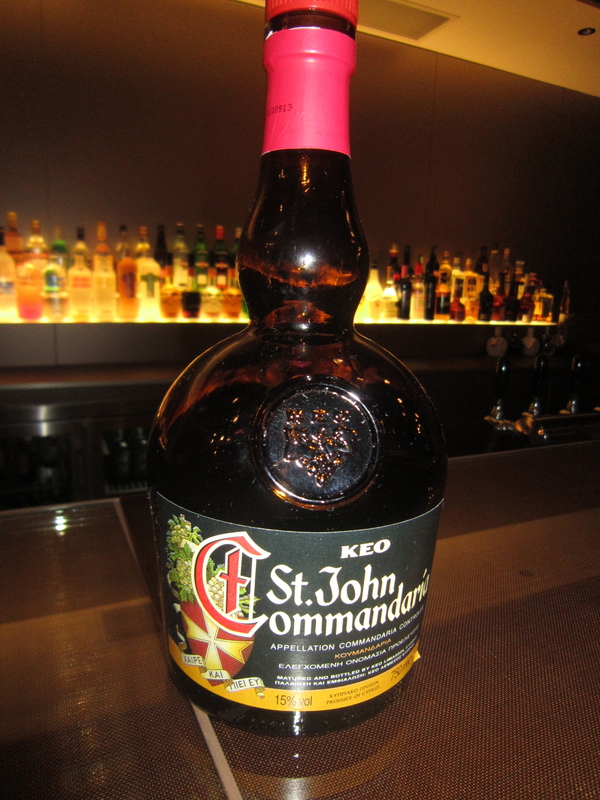 As a fortified wine, Commandaria travelled well and was exported throughout Europe. It was popular in England, for example, not only in the 13th century but later and was a favourite of the Tudor Kings including King Henry V111. Commandaria is made only in a defined region of 14 wine producing villages in the Troodos foothills about 20 miles north of Limassol. The wine production for Commandaria has remained true to traditional methods. The production is small and it maintains its ranking among the world’s classic wines. In 1993, the European Union registered Commandaria as a protected name and geographic origin. 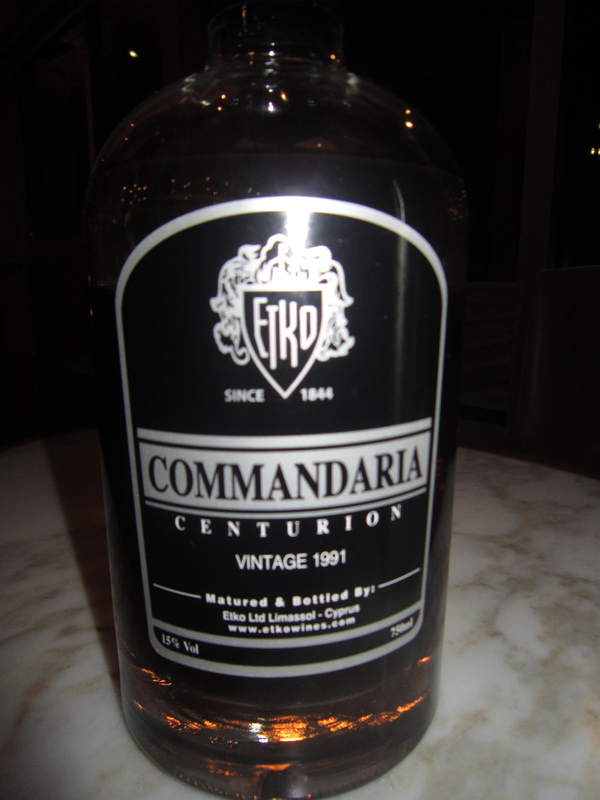 Commandaria is regarded as an eastern mediterranean equivalent of its western mediterranean cousins, Port and Sherry. We found it had both similar and different characteristics and was more refreshing and lighter with higher acidity. Its high alcohol levels are due to naturally high levels of sugar from the sun dried grapes and the fortification process of adding pure grape spirit. Some Commandarias are made using the solera method of blending wine batches from different years as is used in the production of Sherry in Jerez. There are occasionally single vintage cuvees produced in exceptional years and the Centurion Vintage 1991 is an example. Sweet wines have largely declined in popularity over the years which is sad as their complexity and full flavours have a lot to offer. Our conclusion: it would be very easy to enjoy drinking a glass of Commandaria with a Creme Brûlée, Tiramisu, a coffee semifreddo or to accompany a coffee after a meal, or to take a leaf from late harvest wines, to enjoy with blue cheese. This historic wine can now be bought on line through Amazon; what better example of the Ancient World meeting the 21st Century! This entry was posted in Cyprus, wine and food and tagged Commanderia, Cyprus, Cyprus wines, Minthis Hills Golf Club, wine scene by elizabethsvines. Bookmark the permalink.